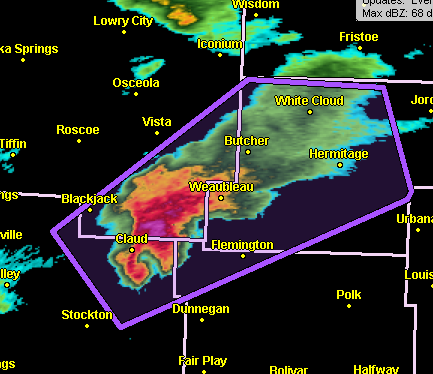 The radar indicates a classic hook echo south of Claud, MO with a tornado likely. Note: I am NOT going to post every tornado warning. I'm posting the first of the day to indicate the seriousness of the threat at a time of year when tornadoes are not common. AccuWeather has the latest warnings here. 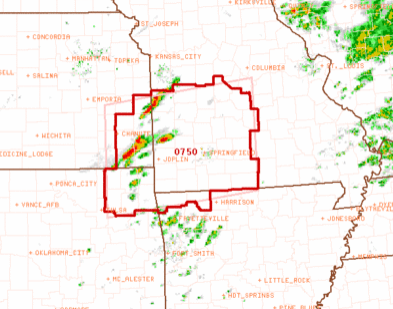 The National Weather Service has issued a tornado watch effective until 10pm for the Four State Region. Those thunderstorms may also cause large hail and damaging winds.